Sailing is a great social and family activity while children develop some valuable life skills such as independence and resilience. The sheltered waters of Charteris Bay make an ideal spot for children to experience sailing for the first time. We offer a progression of sailing instruction from Learn to Sail (beginners), to Green Fleet (learn to race), to Open Fleet (competitive sailing). This is done in camps, Spring two day and Summer three day. We also have after school sailing Monday/Tuesday every second week in terms 1 and 4. Children should be 8 years or older to participate. Fees are available here. Programme dates and times are here. The children learn to sail in plastic optimists, suited to children under 55kgs. If children are keen to continue beyond the Learn to Sail level families need to purchase a boat and are expected to become club members. We strongly recommend you ask club members for advice on boat purchases! The courses cover on-shore theory, rigging, launching, on-water coaching and fun activities, capsizing and retrieving boats. Parents are expected to be actively involved and to stay at the club. It is a great opportunity for adults to learn new skills. We encourage all Green Fleet sailors to participate in club day sailing, every second Sunday during the season as well as their Monday and Tuesday instruction. CBYC also has an Adventure Sail group aimed at children who have completed the Learn to Sail programme and are more interested in sailing for fun than learning to race. We aim to build the sailors skills and confidence and extend their range with the safety of a rescue boat and instructor. They may also choose to join club races just for fun. Adventure sailing is a 2 hour session, run on the last Club Day sailing of each month. 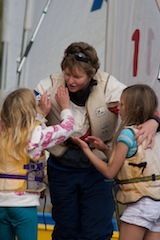 Children must be comfortable being in deep water in capsize situations and have basic swimming skills. If they are unable to swim 50m you must let the course organiser and coach know. Club members will have priority in our Learn to Sail programmes and remaining spaces will be filled on a first come basis. Registration for 2018/19 courses can be done online here.